A quick look at CMS cut point announcements and the impacts of triple-weighted quality measures becomes clear. Medicare Advantage plans need optimized adherence strategies to see rewards in the Star Ratings program. Success requires plans to make the most of medications, and that means understanding the intricate nature of their member population’s behaviors. This tells us that, overall, members are concerned about costs prior to filling prescriptions, but then become non-adherent after filling them for a variety of other, often subjective, reasons. In collaboration with our clients, member data is gathered and used to inform clients’ quality measure performance strategies. High-level barrier reporting data aligns with the previously mentioned survey’s data for members who quit taking medications. (See Fig. 1 for an excerpt of findings from a regional health plan client.) 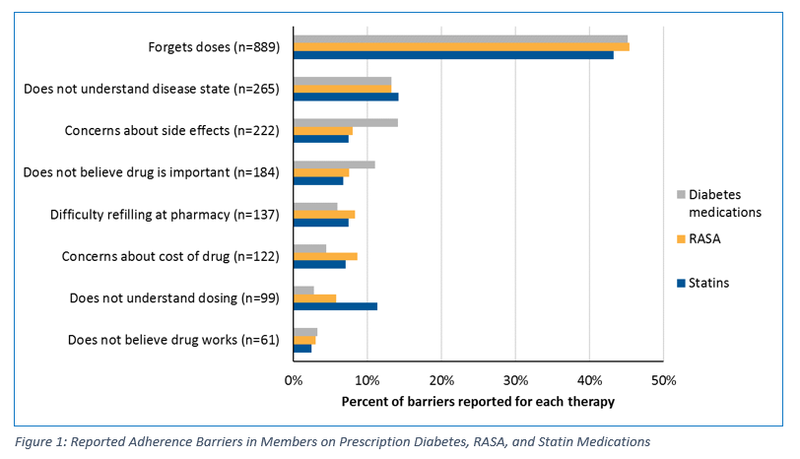 Primary barriers to medication adherence in this data include forgetfulness, understanding of their own physical condition or the drug, transportation/ease of filling at the pharmacy, and cost. Informing better-targeted, more personal interventions (e.g., RxEffect can house barrier reporting, fill dates, notes from previous intervention attempts, and more). Promoting approaches that help members overcome barriers. Adjusting intervention tactics to those that achieve the most positive outcome (e.g., facilitating warm transfers to the pharmacy or involving member’s prescribers/providers). Improving medication adherence requires data analysis and prediction, but it’s more than that. Plans must be able to tap into the ways in which their own member’s behaviors impact their adherence. It won’t be the same from population to population or plan to plan, so implementing tailored, data-based strategies to create valuable interventions will be critical to success. This will be the way forward to not only improve adherence, but also enhance member satisfaction and health. We have been doing this for clients for years – refining cut-point strategies, workflow and network solutions, and analytic methods to drive substantive change among member populations. However, we understand many Medicare Advantage plans simply don’t have the time or resources to do the same. Let our experience and expertise work for you – let’s talk about what you need.